New research from i-sense members at UCL, in collaboration with the Africa Health Research Institute (AHRI), looks at ways data visualisation can help population surveillance sites better utilise and understand the large amounts of data they collect for disease surveillance. The study took place at AHRI, which is a Health and Demographic Surveillance System (HDSS) site that captures specific population data to monitor health changes brought about by the HIV epidemic in the area of KwaZulu-Natal, South Africa. “There are often challenges for public health communities to extract valuable information from their large datasets in order to make timely intervention initiatives,” says Dr Kobus Herbst, Chief Information Officer at AHRI. AHRI’s Somekele field site collects large amounts of data, so the broad objective of the dashboard study was to increase access to this information for staff and the community, and provide a real-time picture of the data being collected. 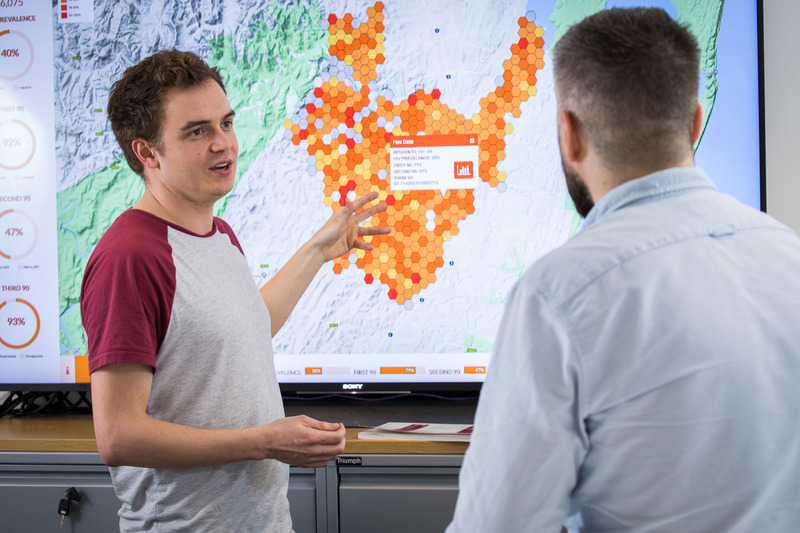 “The aim was to design a dashboard that anyone at the site could easily use to explore data from the ongoing studies at AHRI, allowing users to get an overview of all projects or drill down into a specific set of data as needed,” says David Concannon, PhD student at the UCL Centre for Advanced Spatial Analysis (CASA). The Treatment as Prevention trial site included more than 100 staff members , of which 20 were selected to trial the dashboard, including scientific staff, operational staff, nursing staff, and Community Advisory Board members. Those selected for the study were asked to self-evaluate their computer literacy, complete questions related to interpretation of the dashboards, and complete a questionnaire about the dashboard’s usefulness and usability. The study highlighted important differences in visualisation literacy among user groups that affected their interpretation of the visualisations. Overall, the results of the questionnaire demonstrated a positive attitude towards the future use of such platforms across AHRI studies. “Data visualisation has a huge potential to ensure that these large data sets are used efficiently in a manner that is suitable for a varied audience,” says Dr Ed Manley, Associate Professor at UCL CASA. Such systems require fewer resources than manual analysis of data and have the ability to be adaptable for changes in need. AHRI is typical of a HDSS site and the success of, and support for, such dashboards in this contexts shows potential for implementation across other similar sites. The report of this study has been accepted for publication by JMIR Formative Research. Future data visualisation research within i-sense will extend the advances made within this study. Current research includes an exploration the effect of visualisation literacy on user interpretation and use, and development of novel approaches for tracking and integrating usage into visualisation design. It is intended that these studies will contribute directly to interventions across a variety of contexts, both in the UK and South Africa.